If you’ve ever walked through a show home or browsed your local real estate listings, you’ve probably been most impressed by the listings that feature neat, comfortable, and functional furniture and design. It’s likely that the most attractive homes have been staged by a professional designer or staging company. 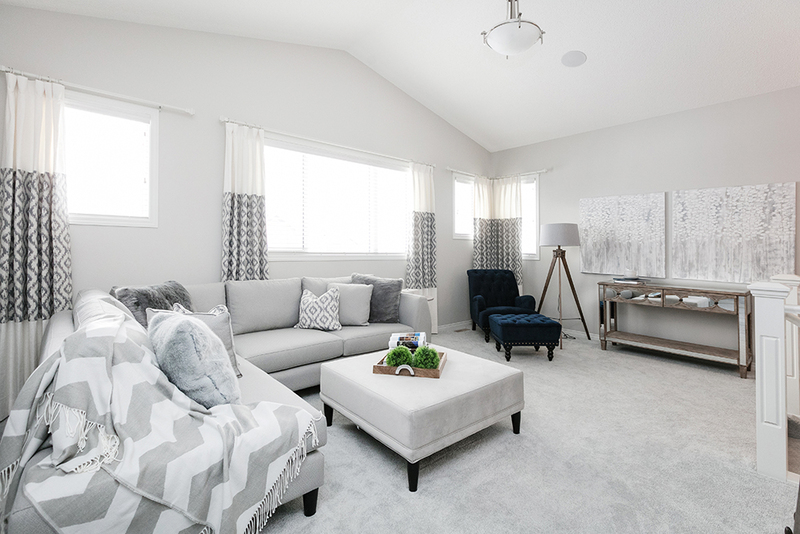 When it is time to sell your home, you want to give buyers the same reaction that you have when you walk into a beautiful show home – you need to give them a reason to consider your home over any other on the market. More and more, sellers are using home staging to do just that! Should I Use Home Staging for Resale? Unfortunately, there is no definitive answer to whether or not you should have your home staged when you list. If you ask a professional, the answer may vary from one realtor to the next, with many offering a yes and no answer - it depends. There are a number of factors to consider before staging your home. Some of these factors include the value of your home, the current state of the housing market, the carrying cost of your property, and whether your home is vacant or occupied. In any case, when you are ready to sell your home, you should ask your realtor whether staging is a worthwhile choice. With that said, let’s talk some facts: in some cases, having a home staged before listing can result in a property spending 90% less time on the market compared to a similar listing that was not staged. Less time on the market means less money spent on carrying costs such as mortgage, utilities, and maintenance. 90% less time on the market is especially enticing if you have already moved into your new home. Investing in your home before selling is worth it! Several homeowner association studies have found that for every $100 dollars that homeowners spend preparing their home for resale (be it in renovations or staging), they can expect a return of up to 4 times that amount. 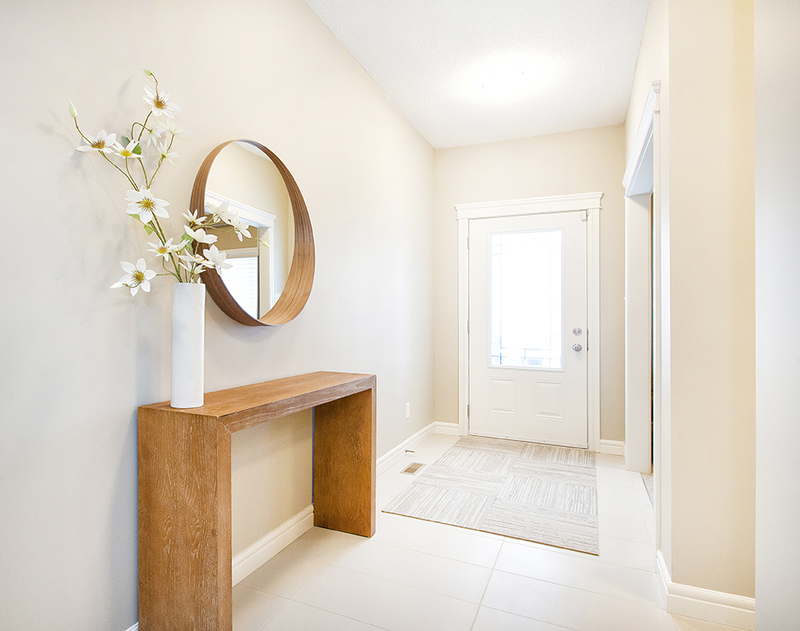 It may seem like a waste of time and money preparing your home to sell soon after, but buyers don’t want to see the work they need to do in a new home, they just want to see a livable, low-maintenance space. There are a few advantages to having your home staged prior to listing, and while it does require more time, effort, and money to get your home ready for showing, it will help make your property stand out from the myriad of other homes listed in the same price range. Yes, home staging is a great way to ensure that your home stands out from others in the market, but, how much does having your home staged cost? Staging can range in price according to a couple of factors, specifically, the square footage of your home, and whether or not your listed property is vacant or occupied. If you or a tenant is still living in the home that you want staged, you may be able to use your existing furniture and décor for staging. In this case, prices can average around $1000 for an occupied condo. However, if your home is vacant and requires furniture and accessory rentals, you could be looking at an average of $3500 for a 1200 square foot home. is a great investment for the potential return you could expect from decreasing the time your home is on the market, there is still a substantial cost associated with having your home professionally staged. Of course, you could always stage your home for showing yourself. If you have an eye for detail, or if you think that you’re up to the challenge, you can stage your own home using some of the furniture and décor you have now. A baseline understanding of staging best practices and focusing on a few big picture improvements can give your home an edge over other properties on the market. How do I stage my own home? Many homeowners have had great success staging their own homes, saving money on the staging process, and on their home sale as well. So, once you’ve decided that you’re going to stage your home yourself, where do you start? Here are a few important staging principles that you should learn to ensure that any prospective buyers are drawn towards your home instead of the others on the block. Step one: De-Clutter. To kick start your staging process, get rid of any and all knickknacks. The fireplace mantel, junk table, and shelves are great places to find knickknacks… clean them out! Potential buyers aren’t interested in seeing your things – they’re looking for places where they’ll put their things. Another important part of the de-cluttering step is to maximize storage space throughout your home. Reduce the clothing, utensils, cutlery, and food in your closets, drawers, cupboards, and pantry by half. Keeping your storage spaces half empty will make it seem as though there is even more space than there already is. The best part about the de-clutter step is that most of the things you purge can either be donated or packed up… why not make your moving day easier too? Step two: De-Personalize. Maybe one of the hardest parts of staging your own home is removing any pictures, gifts, or personal items that might interfere with a buyer’s imagination. When someone views your home, you want to ensure that they are viewing a space that is no longer yours – it’s theirs. Family photos will make buyers feel as though they are looking at someone else’s home, and not necessarily a home that is perfect for them. Step three: Neutralize. One of the best and easiest ways to stage your own home on a budget is to paint. Hands down, you’ll get the most bang for your buck by applying a fresh, neutral coat of paint throughout the entire main floor area. This one goes hand-in-hand with de-personalization: you may think your red feature wall is a great design decision, but a buyer might not feel the same way. Any bold colours should be re-painted in a more neutral tone. 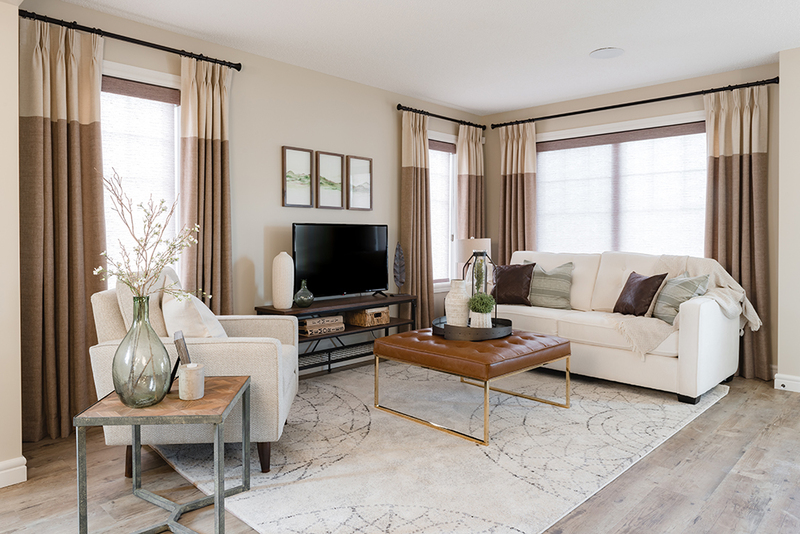 Neutral colour palettes can help buyers visualize their own belongings in a space, and that principle extends to window coverings and furniture too. Step four: Modernize. Yes, those gold plumbing fixtures were great at one time, but the unfortunate reality is that the majority of today’s buyers are looking for something a little more this century. Consider swapping out gold fixtures for more modern nickel or chrome taps and faucets. Likewise, cabinetry in the kitchen and bathrooms can be modernized for less than $200 with a coat of new wood stain, or by sanding the surface and applying updated paint. The old brass and wooden hardware on your drawers and cabinets should also be replaced with brushed nickel or stainless handles, which are affordable and effective for enticing buyers. And the most important step of all: Cleaning. Don’t ignore this step, even if you hate chores. Make appliances shine, clear off the countertops, put clean and neatly folded white towels in all the bathrooms, and make sure carpets and floors are spotless. Get rid of any odors: a large number of buyers can be turned away the moment they enter a home, just by the smell. If you smoke, have a pet, or have recently cooked a meal, open a window, use air freshener, or even invest in an air purifier before a showing. With these main principles in mind, you have a great starting point for staging your own home. Now, let’s get to the actual staging part. Whether your home is occupied or not, you should make your rooms feel lived in, but not messy. 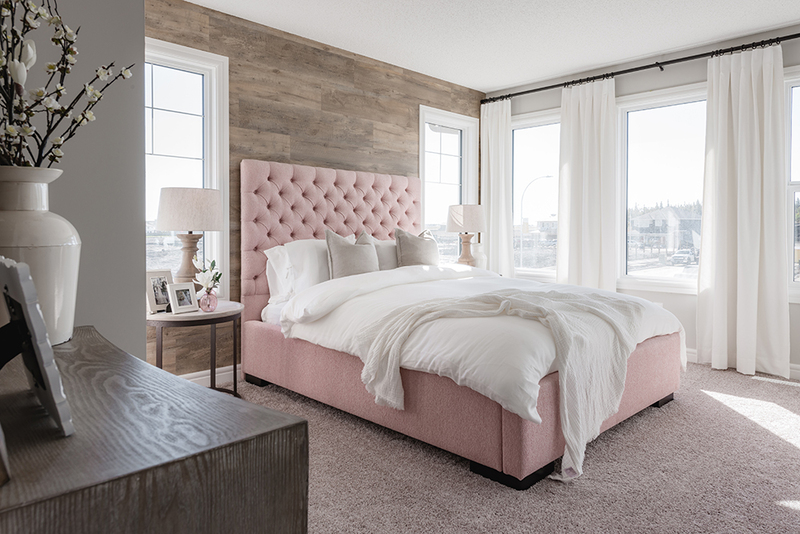 A bedroom with open window coverings to let in the light, neutral furnishings, a neatly made bed, and a comfy blanket is perfect for conveying a neat, cozy fee in the bedroom. Remember, your spaces should be inviting for any buyer, regardless of personal taste. When arranging furniture, pay attention to the flow of a room. Resist placing too many furniture pieces in one room, and if you can, position furniture away from the walls to make the space feel larger and more roomy. Make your bathrooms feel spa-like. A few unlit, scented candles, white hand towels, and clear counters can make any buyer wish they had a bathroom like yours. Clean and tidy is key here! These are just a few easy and affordable steps you can take to stage your own home for resale. Know any other tips that sellers should consider when staging their homes for sale? Let us know in the comments!